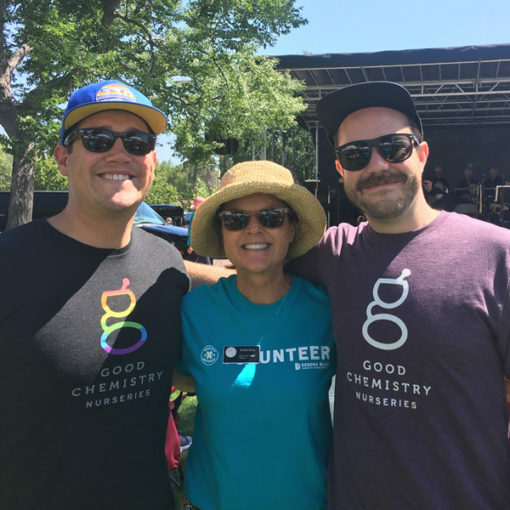 On Saturday, August 19, 2017 the Good Chemistry Nurseries team gathered at Denver’s Bible Park to celebrate local food, music and community at the South by Southeast festival presented by Denver City Councilwoman Kendra Black. The one day festival featured local bands, regional restaurant booths, a farmers market and beer garden as well as retail and craft vendors from the Southeast Denver community. The lineup of local artists included the Denver Municipal Band, Beverly Belle, Late Night Date, Milma and more. Food trucks offered a bounty of delicious bites, from sweet and savory crepes to traditional BBQ. Festival goers were invited to participate in a community art project to beautify Southeast Denver. At Good Chemistry Nurseries we take pride in getting to know our neighbors and were pleased to sponsor the South by Southeast festival this summer. We look forward to continued support of Southeast Denver and its vibrant community. Learn more about Good Chemistry’s other philanthropic initiatives and how you can contribute.